For signaling tests, the 5G NR signaling tester R&S CMX500 is combined with the R&S CMW500 wideband radio communication tester. Rohde & Schwarz and Qualcomm Technologies, Inc., a subsidiary of Qualcomm Incorporated, have successfully validated 5G NR cellular sub 6 GHz signaling tests, bringing the commercial roll-out of 5G NR one step closer. The end-to-end tests were done using the new R&S CMX500 radio communication tester, which will debut at Mobile World Congress 2019 in Barcelona. With this new test platform along with the R&S CMP200 and R&S CMW100, Rohde & Schwarz is completing its portfolio for standard compliant device tests for 5G NR. Rohde & Schwarz, a premium supplier of test and measurement solutions to the wireless industry, announced today the successful verification of an end-to-end data transfer between the R&S CMX500 radio communication tester and smartphone form factor test device powered by the Snapdragon X50 5G modem and antenna modules with integrated RF transceiver, RF front-end and antenna elements. The test device was verified under signaling conditions compliant to 3GPP Standard (Release15) in Non-Stand Alone (NSA) mode. This effort between Rohde & Schwarz and Qualcomm Technologies paves the way to get 5G New Radio technology ready for commercialization. Rohde & Schwarz has been supplying reliable and futureproof test and measurement solutions to the wireless industry since the development the GSM system simulator all the way to current cellular communications technologies such as LTE-Advanced Pro. For the fast emerging 5G standard, Rohde & Schwarz has rounded out its portfolio: For signaling tests, the 5G NR signaling tester R&S CMX500 is combined with the R&S CMW500 wideband radio communication tester. In addition to the protocol testing during the R&D phase, the solution can also be used for calibration and non-signaling tests and also supports the test of the related LTE-A features, such as 5CC and 4x4 MIMO. For non-signaling tests, the R&S CMW100 communication tester covers testing in development, evaluation, verification, calibration and manufacturing for 5G NR FR1. 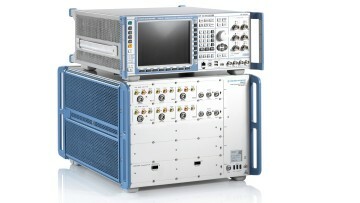 Rohde & Schwarz has developed the R&S CMP200 radio communication tester for verification and calibration of 5G NR FR2 in the mmWave range. This non-signaling one-box tester addresses efficient high-volume RF parametric testing in R&D and manufacturing. These up-to-date solutions enables customers to fulfill their 5G requirements in the chipset, smartphones, tablets industry for reliable, efficient and scalable testing. Rohde & Schwarz is showcasing its comprehensive portfolio for 5G NR device test at Mobile World Congress in Barcelona from February 25 to 28, 2019 in hall 6. For further information on the trade show presence, go to: www.rohde-schwarz.com/mwc. Qualcomm and Snapdragon are trademarks of Qualcomm Incorporated, registered in the United States and other countries.Qualcomm Snapdragon is a product of Qualcomm Technologies, Inc. and/or its subsidiaries.